Any numbers still unregistered at the end of July will be disconnected, the government says. The BBC's Odhiambo Joseph in Nairobi says many people there support the move, hoping it will make life more difficult for criminals. Kidnapping gangs often use unregistered mobile numbers to text ransom demands, he says. Police commissioner Mathew Iteere told the BBC's Focus on Africa programme that mobile phones must be registered because they could now be used like computers. "It has become a tool of banking, it can be used to steal data, [to] transmit unauthorised information and perpetrates huge frauds." Information ministry official Bitange Ndemo last week said registering the numbers would help the authorities tackle terrorism, drugs-trafficking and money-laundering, as well as the sending of hate messages. Neighbouring Tanzania has already started a similar exercise, so our reporter says it is not controversial. He says the outlet he visited was packed with people registering their numbers. Kenya has about 20 million mobile-phone users - about half the population - and has a well developed mobile-phone banking network. 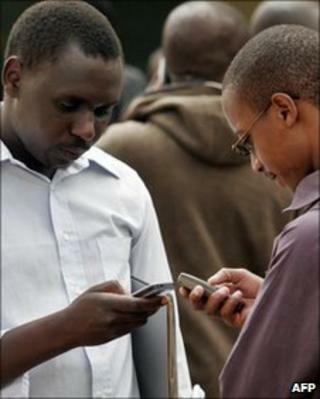 Between 97-99% of mobile-phone users in Africa use pre-paid vouchers, reports the news agency Reuters. It is easier to use pre-paid vouchers without registering an address. However, some analysts say registering people in some African countries may be difficult if they do not live in a house with an official address. What do you think about this plan to register all mobile phone numbers? Will it cut crime?